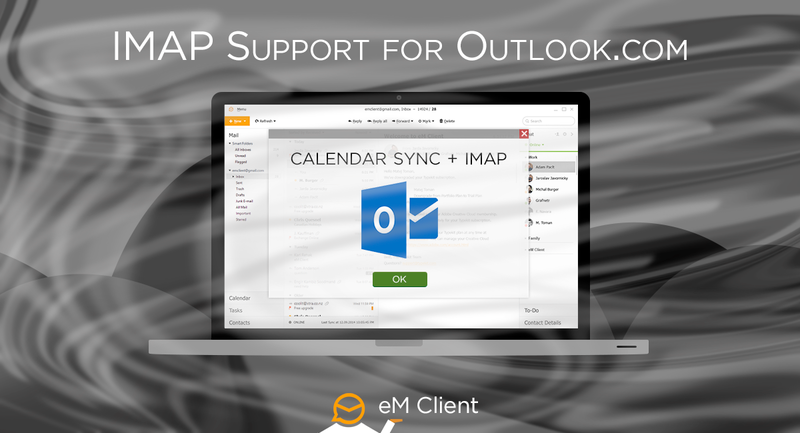 Outlook.com users can look forward to synchronizing their accounts using the standard IMAP and SMTP protocols as you may be used to from other account types. Up until now, it was necessary to synchronize your account over the AirSync protocol, which has not proven so reliable and may have been generating a couple of issues when the Outlook.com servers have been swamped with requests. We believe the new way of synchronizing your account will be more efficient and will considerably decrease the number of issues while synchronizing your items with Outlook.com mail servers. However, note, that this doesn't mean we're dropping the Calendar and Contacts support on Outlook.com, these items will be safely synchronized over the existing AirSync protocol and you willl still be able to work with both services as well as your email or disable your calendar in case you don't use it. Follow us on Facebook or Twitter to find the latest information about the upcoming features of eM Client 7.